Since yesterday’s post, I have come across three distinct, separate situations that boil down to the same theme, so I figured I am meant to write something along those lines. In any given day, there are conflicts, some of which seem to have multiple possible solutions, so the trick is in figuring out which is the best one. I’ll use my conflict from yesterday, for expediency, although a work conflict, a divorce conflict, a family conflict could all be inserted, because I have heard all of them in the last 24 hours, and the end result is the same. So yesterday I am in a meeting meant to foster sobriety, and it did anything but that. The chair of the meeting appeared drunk, and the attendee who shared did nothing more than further agitate himself, and frighten (or at the very least made uncomfortable) every member in the room. So now I as an individual have a conflict… I am upset, rather than inspired, at the end of my meeting. I am very concerned for my friend who seems to have relapsed but is in denial. What, exactly, am I supposed to do next? There are many possible scenarios that could be legitimately considered as a solution. I could decide that as a member of a fellowship, I have an obligation to get to the bottom of my friend’s odd behavior. That solution would change the direction of my actions and attitudes for however long it takes to achieve the solution I am seeking. Or I could take the perspective that this particular meeting is toxic, and that as a member of a fellowship I have an obligation to fix the problem, and do everything in my power to ensure that yesterday’s drama does not happen again, because it could be turning away potential members. If someone had been new in that meeting, I guarantee you he or she would not be coming back, so again, this is a logical train of thought. I am sure if you are reading this you already have an alternative lined up in your mind about a possible solution. That is the thing about conflict… who is to say what is the one exact course of action? So here’s what I did, and what, in my opinion, needs to be done in all of the other situations I encountered between yesterday and this morning… ask yourself: what is the reason you are in the situation? Why are you doing what you are doing in the first place? For me, the answer is simple. I am attending a meeting every day to ensure I stay sober for that day. I can be of service to anyone who honestly asks for my help, I sincerely try to do that on a daily basis. But the buck stops with me, and I need to stay sober. To stay sober, I need to steer clear of unnecessary drama. It’s really that simple, and it really solves any problem I have from yesterday. I am not going to crusade against wrong action, because that does not keep me sober. I am not going to chase someone down who does not admit relapse, because that does not keep me sober. I am not going to hold one bad meeting against the fellowship of AA, because… well you get the picture. Insert your own problem into this framework, and give it a shot. When I get back to the basics, and not let outside influences cloud my perspective, the solution becomes a lot clearer. A woman I know well was there, and, to put it bluntly, seemed stoned in every way… her words were slurred, her gait was off-balance, her eyes unfocused. That fact alone is upsetting enough, but to add to my alarm is that I know her personally, she actually has about a month or so less sober time than I do, and I met her at her very first post-rehab meeting. Now, a person in recovery who has potentially relapsed is, sadly, not a new story, but here’s the twist: She was chairing this particular meeting, and she was not acknowledging her altered state in any way. This led to all sorts of difficulties within the meeting… it was difficult to understand her, she “held the group hostage” with her speaking, and, therefore, by the time she opened it up to the group for sharing, there were only 8 minutes left in a 60-minute meeting. And here’s where the drama begins… an agitated member spent the remaining minutes yelling and cursing about how angry he was at this situation. I have honestly never felt as uncomfortable in an AA meeting as I did today. While he certainly had a right to his frustration, he (in my opinion) exacerbated an already tense situation. So, what do I take and what do I leave? Whatever the opposite of “strong suit” is, that is my relationship with confrontation, I am impossibly bad at it. And yet, I was legitimately concerned for her well-being. A friend and I tried to speak with her after the meeting, she claimed she was exhausted and nothing more. She had sober women who were driving her, so the immediate safety concern was resolved. I guess what I can take from this morning’s adventures is “there but for the Grace of God go I.” I am so grateful to be sober today, and for there to be no question of my sobriety. I can also use this as an example of what NOT to do. When you chair a meeting, you have an extra responsibility to the group, and this morning was a big reminder of that fact. And I will leave that man’s agitation, and his judgments, behind… I am responsible for my own recovery, not anyone else’s, and if someone is unwilling to be honest and reach out for help, then there is not much more I can do except be there if and when the time comes. 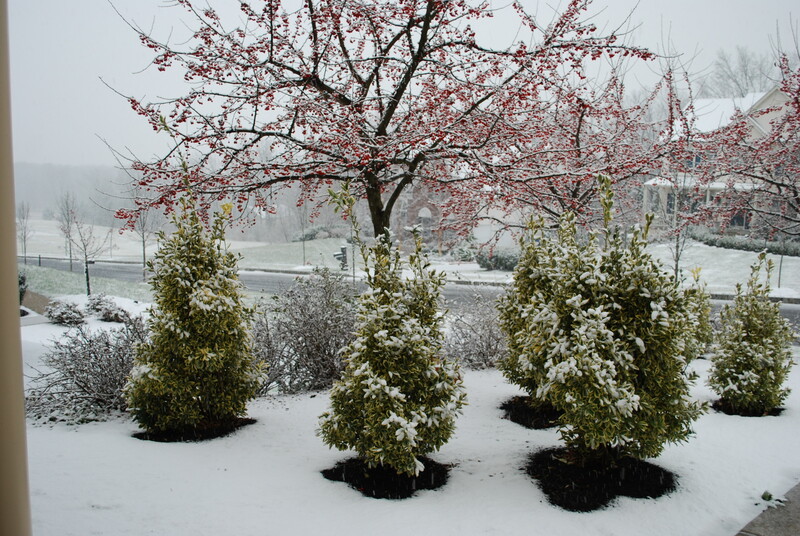 This is the view from my front door as of 8 am the morning after a 6-day break from school. My sanity is being tested very early this morning! Verbatim will take this post into the 1,000+ word category, so let’s fast forward. Reilly tattles, the incident is small, but extremely typical of Danny. Danny flat-out denies, and a heated argument ensues. I ask Danny to admit what he did, he repeatedly denies his wrongdoing, and now I get involved. Me: “So, Danny, you are saying that even though the incident sounds exactly like something you would do, and even though Reilly has never been known to lie, and you have been known to be less than honest, you are still claiming that you did not do it? At this point we are getting out of the car and into our home. I hand out various punishments, and start to send them to their rooms. Danny lingers, and I seize the opportunity. I can now process this incident in one of two ways. I can feel immense guilt that my past mistakes have somehow taught Danny by example how to lie to get out of uncomfortable situations, and I can beat myself up for being the worst Mom in the history of the world. Or… I can use my past as a tool. First, I have an empathy for Danny, because I have been there and done that. And since I am actively working on correcting my past, I am in a position to teach him how to do the same. If You Want What We’ve Got, Then Do What We Do! First, I hope everyone had a wonderful, blessed Thanksgiving day. I did. I was most grateful for being able to cook a meal alongside my husband, while navigating through children-generated chaos, and to sit down at a table and share that meal with people I love, and who love me. It is a small way for me to give back to the people who weathered the many storms I brought to their lives. But onto new topics… today I attended my regular Friday morning AA meeting, this week was a speaker meeting. I had never met the woman who spoke, but it felt like I did, because she told my story. I have heard many speakers in the last 10 months, and I can usually relate to some part of their story, but today was the first time I actually felt uncomfortable as I listened, because so much of her pain was my pain, and it hurt me to relive it. But here is the cool part of recovery… growth. In the past, when I heard something to which I could relate, I would feel a sense of kinship, or I would feel validated that I was right where I needed to be, which is good stuff. Today, I heard this woman’s message, and I realized that while I am proud of the accomplishments I have made, I can see, through her, what I aspire to be. While I don’t enjoy remembering how bad it was, I can look to this woman as a source of inspiration, and realize that I have more work to do. I want what she has, so I need to do what she does. For me, that growth took place by walking up to her after the meeting, introducing myself, and letting her know how her story affected me. I am still on the shy side when it comes to opening up to speakers and chair people, but I realized that if I want to learn from her, she has to know who I am. So I just did it. And she was as wonderful as I knew she would be. We exchanged phone numbers, and I hope to meet up with her again soon. It is just another step on the journey, but I can recognize the steps as I’m taking them now! This past week I have been struggling with a family issue… divorce, where the ex-family member is wreaking havoc in the lives of those I care deeply. It has bothered me for any number of reasons, but the primary issue has been that I have not been able to apply the principles of recovery to solve the problem. Yes, I have prayed for the idiot, but I would like to be able to help give some peace to the family members I love, and I haven’t been able to figure out a way to do it. So this morning as I was fixing my hair, I was (again) trying to come up with something I could share that would help her, and her children, and I had a God moment… maybe all these things are happening to teach her something, and so it may be time to analyze the problem from that perspective in order to get some clarity. Because, no lie, this issue has been going on for more than 5 years, and there are children involved, so something needs to give, and since we can’t control the idiot himself, we have to look elsewhere to get some peace. So I felt some comfort in this train of thought, and decided to write about this subject today. As I logged onto to WordPress, this giant banner is what greeted me. Coincidence? via Everything Happens For A Reason. I have written frequently about the idea of perspective, and how things are as bad or as good as you believe them to be. Someone might look at my last 293 days of sobriety and think, “big deal,” whereas someone who has been trying and failing to get sober might think 293 days is a lifetime. So when I look at other areas of my life, I try to put the same grateful, positive spin that I do on my recovery… every day is a miracle, and every accomplishment is a milestone. Try as I might, that old thinking does come creeping back, and it is hard to fight. For example, I have started an AA meeting, today was the 4th time I have held it. The first week I had three attendees, second week, 7 attendees, third week, 5 attendees, and this morning, back to 3 attendees. YOU’RE GOING THE WRONG WAY!!! (quote from Planes, Trains and Automobiles). Don’t get me wrong, this is still my favorite meeting of the week, I have left each time with an overwhelming feeling of gratitude, and the small numbers make for some really meaningful exchanges. But to show my results to almost anyone else on the planet, it looks like I am, if not failing, then certainly not succeeding. Same general concept with this blog. I have been writing for 8 months now, and my “numbers” have certainly grown, but when I compare my blog to some of the others I follow, then I have to wonder… what am I failing to do? So, to combat these insecure feelings, I have to rely on my newly formed instincts… for the meeting, while I feel like I’ve done a decent job getting the word out there, I just have to keep trying, and keep marketing. I am working on getting it listed on websites and our local AA directory. Most important, I have to remember what I learned at the first meeting 293 days ago, which is that TIME stands for This I Must Earn. For the blog, I have asked myself what it is I see happening with others that I do not see happening for myself. In reality, it comes down to something so ridiculous, I am embarrassed even writing it down… I have yet to see my own blog listed on others’ “blog rolls.” So, the next logical question, who do I have listed? Answer: no one, because I have never taken the time to develop that particular table of contents. So, in the spirit of evolution, I have spent (I kid you not) two hours of my lifetime figuring out how to do it, and I now have a “blogs I follow” section on my front page. Seriously, it took me 10 minutes just to figure out how to even view my own blog! I also attempted to upgrade my “Gravatar” to include a picture, who even knows if that actually worked. Here is the point: if I want to break through the plateau, I have to keep moving in a direction. If it doesn’t work, at least I am moving! So I titled this post very deliberately, because at no point in time do I want to mislead any reader of this blog: I live a charmed life. I mean it, I am incredibly blessed. And I say that with full knowledge that I have the incurable, progressive, fatal disease called addiction, I am still conscious of how beautiful my life is. Now, having said that, life can still be challenging, frustrating, disappointing, monotonous. Just because I have all these blessings does not mean that I don’t still want to whine and complain when my expectations do not come to pass, or when I am frustrated by the actions of others, or just simply because! I do my best to “practice these principles in all my affairs,” but because I am still human I will often fall short of the mark. The frequent response I hear when I complain is “think of how much worse it could be.” That a situation can be worse is a given; if you have a situation, you are alive, so there is always a lower bottom. That line of reasoning, while intended to soothe, frequently has the opposite effect on me, and riles me up even more. Most times, for me, a simple validation of my feelings would do the trick. Now, having used up my quota for whining and complaining, time to let it go! Because while it is okay for me to feel disappointed, frustrated, disheartened, it is not okay to waste my day wallowing in it. If I wallow in it, I will make it bigger than it is, and lose sight that anything with which I am dealing is nothing more than a privilege problem! On Monday I celebrated my birthday, thanks for the birthday wishes! Yesterday I had the opportunity to visit my “longest” friend (I would say oldest but that sounds offensive). It had been a few years since I’ve seen her, but like all authentic friendships, it was as if not a day had passed since I’ve seen her last. We had several hours together, and were able to connect in that way only friends with shared history can. It took me until almost the end of our time together, but I finally summoned the courage to tell her about my addiction, and my recovery. You know how it is said that most times when an alcoholic believes he is telling someone the news for the first time, it usually not the surprise that he thought it would be? That was not the case yesterday, and so my confession was difficult, but, in then end, a liberating experience. Since yesterday, I have spent some time contemplating the entire experience, reflecting on how she took the news I shared as well as how I felt about the various issues in her life. It was illuminating, and yet so simple! First, everyone has problems (duh, but sometimes I really forget), and worrying about whether my problems are better or worse than anyone else’s problems couldn’t be a more pointless exercise. Second, and way more important, there is one bottom line to all problems in life… turn it over to God. Period. Connecting with a Higher Power, and giving Him my worries, is the solution to any situation that comes along. The opposite of fear is faith, so if you have faith, there is truly nothing to fear! 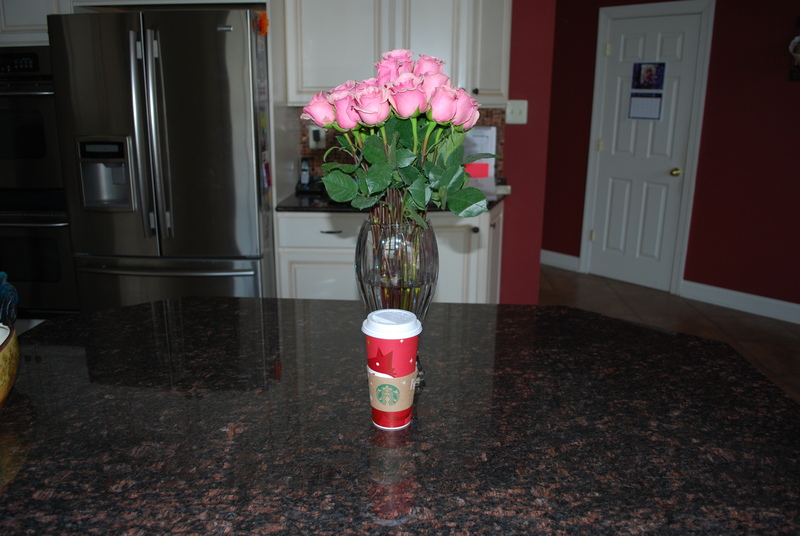 the pink roses and venti skinny vanilla latte my husband had waiting for me when I got up this morning! Have a wonderful day, I know I will!